By popular request. A series of small buildings to do basic tasks. No new buildings, but work times for Mini Wood Cutter and Mini Workshop changed to be a little slower to encourage you to use the full building eventually. These shouldn't be replacements for the originals, just starters. Gatherer and Hunter have expanded production history boxes. Hopefully fixed the Town Hall crashing problem for 1.0.4 users. Hopefully fixed the strange problem of two people sharing single jobs when you place two buildings too close to each other. Mini Workshop now has the ability to make Rough Tools from Iron Ore, as well has Iron Tools from Iron. 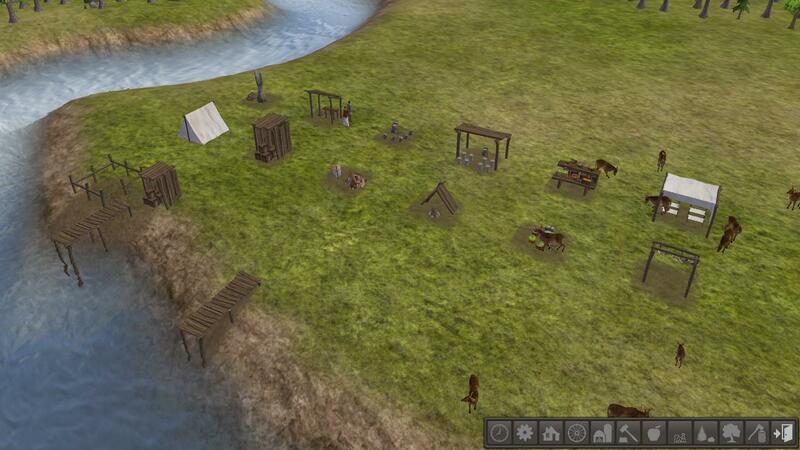 Tweaked the Trading Post a little bit, there was some odd things happening so Materials weren't getting delivered. Not incredibly widely tested, so let me know if there's anything wrong. And since these are mini vanilla buildings, this doesn't require CC to use. Note: This mod has been included in MegaMod. These are all super cute and useful. I especially like them for Adam and Eve starts. is this going to be updated to 1.07? I downloaded this yesterday and it doesn't work. Love the idea though. Hope you'll consider updating it. it does work. i use this mod a lot. it is verty handy at game starts. did you unblock it after downloading? right clikc on the fie and check the properties.then copy to the game windata folder. open game<unless you use the mod manager> ,enable mod and let game reset,,EXIT GAME COMPLETETY<this is critical>> then restart the game.note rar or zip files do need to be unzipped.you only need the pkm files. now as for the mini mod,yes it is an older mod. it does work with the 1.07 thou. if you do not use CC or the RK choice please look into loading a vanilla trade post fix mod. this helps avoid issues with trading due to the upgrade. the townhall production numbers will not have all the new limits.you will have numbers with no description of what those numbers are. otherwise there is nothing in here effected by the changes. i recommend using the mini mod with the blacksmith tool mod.this allows the mini tool shed to make stone or wood tools so you can conserve iron ore.on mountain maps you will find the forest parts are super handy due to the smaller circles. always check WOB for more mods and info. Since it wasn't updated for Banished 1.0.7, I'm not sure the mini-town hall will work. Might not show all of the new flags.